I confess I’ve never been a big collector of crystals – although, like most witches, I have a few. I have a clear quartz that I found during a childhood holiday in Cornwall. It isn't worth much, but has great sentimental value. I have a few small crystals I’ve been given as gifts over the years and which sit in a little pot on my mantelpiece. I also have the lovely jet and amber necklace I won in the Pagan Federation raffle this summer – although jet and amber are both technically organic, rather than mineral, so I’m not quite sure if they count as crystals. Don’t get me wrong, I think crystals are beautiful. I could lose myself staring at them for hours. I’ve been to some fascinating workshops on crystals and I’ve read quite a few books on the subject - including Philip's Crystal Chakra Healing. The problem is I just can’t afford to buy all the lovely crystals I want. When I go into a crystal shop, I’m not drawn to tiny little chips – I want big sparkly rocks. I’d love to have a huge geode, like a fairy cavern, to decorate my room. And I certainly don’t just desire cheap non-precious gems – I'd like diamonds, rubies, sapphires and emeralds too! I guess I have expensive tastes. But, being skint, I tell myself that the crystals I want can wait. However, I do have a big collection of stones that I have picked up when beachcombing. I have stones with holes in them, stones that look like faces and pebbles worn smooth and shiny by the sea. They decorate my altar and sometimes get used in my spellcasting. This is one of the reasons I love the new book by Philip Permutt and Lyn Palmer, Sacred Stones and Crystals. It shows that ordinary stones and pebbles can be just as good for magical and spiritual work as expensive gems. The book is a wonderful introduction to the entire subject of sacred stones. As well as teaching techniques to connect with common stones and rocks that you might find, it looks at ancient megalithic sites such as Avebury. It explains how to dowse for lines of energy as well as offering simple meditation exercises. Myths and legends are also explored – including the tale of King Arthur drawing Excalibur from a stone. Later chapters introduce ways of working with crystals, but explain that you don’t need to spend lots of money buying large numbers of them to begin using crystals for spiritual and magical purposes. It is fine just to use one or two that you find you are drawn to. Philip explains that these are very likely to be just the right ones for you at the time. Publisher Cico Books says on its website: "Since the dawn of mankind, stones and rocks have been revered throughout the world. From Stonehenge in England to Uluru (Ayers Rock) in Australia, and from Easter Island to the Côte des Megalithes in Brittany, France, and Petroglyphs in Arizona, stones are regarded as sacred. You may have collected pebbles and stones that have caught your eye, picked them up, examined them, befriended them and taken them home to make treasures of them. You may have been drawn to a crystal and amazed by an ancient sacred site. Sacred Stones is a guide to discovering your personal connection to the world of stones, pebbles and crystals, all of which have an innate energy." If you are looking for a good introduction to the world of sacred stones, then I would thoroughly recommend this new book by Philip Permutt and Lyn Palmer. It has certainly made me want to wash the dust of my little collection of crystals and use them for some magic. 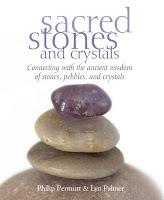 Sacred Stones and Crystals is published by Cico Books and you can order it via Amazon. Amethyst Crystal Chapel Geode on Wooden Base; Weight 2.212 kilos; Height 21cms by 15cms across, 6cm depth - Sold by Spiritual Gifts. Usually dispatched within 2 working days.